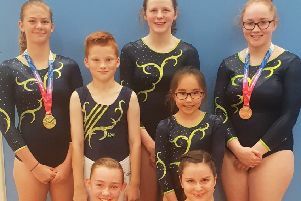 Milly Cole led the way for Orbit at the third round of the National Trampoline League last weekend in Burgess Hill. 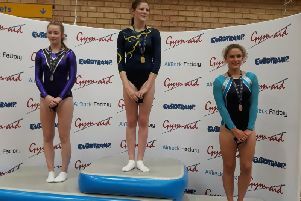 Milly Cole and Millie Heathcote both competed in the 15-16 girls, and after two fine routines each lay in third and second places respectively. Great jumping for the club and a credit to themselves with good point scoring. The top 8 now competed for the day’s final, and fortune favoured the brave, with Millie Heathcote in seventh place, and Milly Cole taking the gold. Young Asami Gynn competed in her first National competition in the girls 9-10s. This was to be an experience in preparation for the future, and the completion of both routines was our only expectation. However, Asami made her own impression by jumping better than ever before, and not only completed both routines, but scored real points by claiming 12th place out of 22 girls. A really welcome surprise. Next came the 15-16 girls with Imogen Wells competing after a break caused by illness. She had been training well, and kept her confidence completing two fine routines, and after two rounds she lay in third place. The subsequent rounds continued and Imogen finished in 12th place out of 55 other girls. Sunday saw Orbit's Level 2 competitors step up and Olivia Webb warmed up in the 13-14s showing real class. This held in the compulsory routines, and Olivia lay in second place. However, disaster struck in the voluntary, and Olivia was forced to stop after her third skill, running out of trampoline. No points today for her, and she will try again next month, but at least uninjured. Rachel Marsh jumped steadily and with calm confidence, completing both her routines in good style. Yet another 12th place, scoring good points with a hope for making the National finals in November.